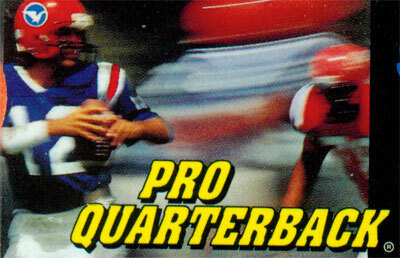 Pro Quarterback is a football game featuring 27 different teams. Since this game doesn't have an NFL or NFLPA license, there aren't any real NFL teams or players here, although the teams included in the game represent the cities of their real life NFL counterparts and also mimic the colors of their team's uniforms. The games options allow the player to choose to play on 6 different field surfaces (grass, mud, dirt, snow, rain and artificial turf) and to choose how long the game will last (2, 5, 10 or 15 minute quarters). There are also no penalties in this game whatsoever. Gameplay consists of playing on both offense and defense. There are 26 different offensive plays and 18 different defensive plays to choose from. The game has a down the field view when on offense, so the game doesn't have receivers in windows.